Felines have quite the personalities as cat lovers know and as you'll see from the exclusive Morris the Cat "Dear Abby" style advice column guest post series he just started penning (I mean pawing) for MBE. Morris and I have even more sage advice for those of you who adore your cats and kittens: Want your cat to purr up a storm and love you even more? Click and enter the giveaway below to win a 9Lives Cat Food giftbasket that will feed your four-legged friend delicious food for months. In addition to entering to win for your own cat, Morris and I both hope you'll consider posting a Tweet using the hashtag #MorrisFeeds. If you do so, Morris will personally see to it that a bowl of 9Lives cat food is donated to a hungry homeless kitty at one of ASPCA animal shelters nationwide. In fact he'll keep donating, up to a million bowls of cat food! 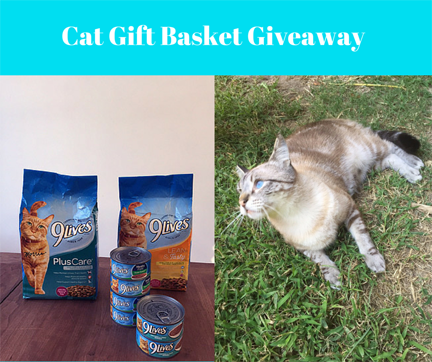 MommyBlogExpert's Morris the Cat 9Lives Cat Food Giftbasket Giveaway ends November 10, 2015 at 12 am PT and is open to legal residents of the U.S. only. 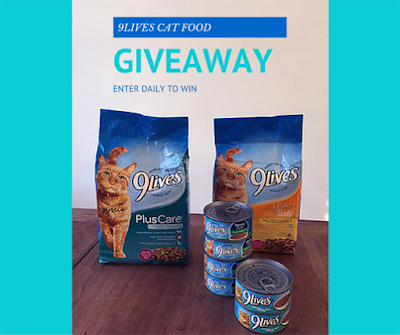 9Lives is providing the prize and shipping to the winner. Winner of this MBE contest will be selected at random from all entries and will be notified via email and must respond within 24 hours to claim their prize. Don't miss this blog's Morris advice column guest post series. For more Morris tips visit the official Prospurr 9 Lives site. You can also stay in the loop by following the socially responsible yet hilarious cat world of 9Lives on Facebook, Twitter and Instagram. And, if you tweet #MorrisFeeds, Morris will have 9Lives donate a bowl of cat food is donated to a hungry kitty at the ASPCA animal shelter, up to 1 million bowls of cat food. FTC Disclosure: I received a package of 9Lives cat food to facilitate the associated MBE Morris the Cat guest post series and the #MorrisFeeds Twitter campaign. However opinions here are my own. See complete FTC Disclosure information that appears at the bottom of MommyBlogExpert's main page and at the bottom of every individual post on this blog, including this one. This is a great giveaway! I'm going to send my cat owning friends your way! My kitty just loves this food! I am sure he would appreciate this so much! We've never tried 9Lives, mainly because I don't see it stocked where we shop for pet supplies. I love that the brand is donating food this month with the tweets though! I want to win this for my 4 year old cat, Snickers. My cats love 9 lives. This is a great giveaway! Looks like such a fun giveaway! My cat would love this! I have heard good things about 9Lives. I will have to try it out! This is a great giveaway! I'll have to send this to my sister. What a great giveaway. I loved seeing that kitty on TV as a kid, he was my favorite and probably why I love orange kitties so much! That's such a great prize! I bet our cat would love trying out that cat food. I would love to win this for both of my cats. Their names are Snuggles and Tiger. This is such a great giveaway. I have actually not tried 9Lives yet. We used to have kitties. I miss them so much! I have 5 cats and do rescue (socializing kittens and cats) and feed a feral colony. The older cats love the wet food, so any of them would be happy to have it. Ozzzy is 16 he loves 9 Lives. Love tour cat. Im an animal lover myself but currently have no pets as my last one died. Im nervous to get a new one. It is nice to see Morris still around. I always thought he was a cute kitty when I was younger. This is a fabulous giveaway. I don't have a cat, but my sister has. I will share this with her. I am hoping to win for my 4 special cats. They are all rescues and indoors only. They are my family and babies. Their names are Bubba, Little, Chester and Ryder. Thank you for the chance. If only I had cats! What a great giveaway opportunity for those who do. I'd like to win this for my wonderful red tabby kitty-boy, Joey! I'd like to win this for my girlfriends cat, Rocky. I am hoping to win this for my granddaughter's two cats. I would love to win this gift basket for my awesome kitty Binx, and our new friend, a stray cat who recently adopted us, still coming up with a name! We love 9 Lives and our kitties would love to win this! I so hope to win this for my daughters Kitty cat. We have only had him for 2 years, but we all love him! I'd hoping to win it for Ferris. This great cat basket would be for our two cats Ozzy and Buddy, they would love it! I would love to win this for my sweet little girl Desiree. I would love to win this for my sweet cat, Cutie! I'd like to win for my friend Jill's Stella! I feed the feral cats in my neighborhood. They would enjoy the food love. I have 3 special cats I'd love to win this for, but especially for Frankie (gray cat). He loves to get presents in the mail. When we have a package he comes up to see if it's for him. We buy a lot from Dr. Fosters that about once a month it is true. I hope to win for my sweet Baby Girl, who turns 6 this year. Would love to win for my cat Gus. I'm winning this for my friend's two cats. My baby Kiki will love this.